Hello, everyone! I’m kyoycz, The Garbage Man, David, etc. I have an unhealthy obsession with ponytails. I set up this blog as a place to post thoughts and reviews of anime, games, music, or whatever else draws my interest. My goal is to have at least one proper post a week – a moderate to long post on some topic that I expand upon in detail. Something along the lines of this review or these “thoughts”. Of course, there are always the posts like this “review” or… this. I’m not labeling “review” or “thoughts” posts distinctly anymore, mainly because the thoughts posts were just more casual reviews. You’ll probably be able to notice a distinction in how I approach different posts though. I’m always open to suggestions for what to review or simply put out my thoughts on! You can leave a comment here, use the contact form, or whatever else works. I’ll take everything into consideration. Even the terrible, terrible ideas. Also, if anything on the site looks a bit wonky, please let me know! I’m no CSS expert, so I might botch something up and not realize it right away. Where did you come up with the name The Garbage Man Reviews? What’s up with the “Taking Out The Trash” posts? 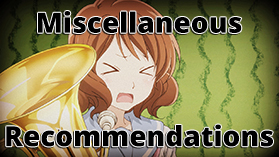 I went into the full details on the first post of that series, but let me give the gist of it here – they’re posts with mini-reviews/thoughts on five anime, games, or albums. They’ll be cycled through in this order: anime, games, albums, anime, games, etc. Barring unforeseen circumstances, one will be released on the 10th of each month. You can read my post on the topic, although it’s already quite outdated (because Shirobako, Hibike! Euphonium, Non Non Biyori Repeat, etc. happened). For a more up-to-date idea, you can check my favorites list on my Kitsu profile. That’s about as accurate as humanly possible. Persona 3 or Fallout 3/New Vegas or Final Fantasy XII or Chrono Trigger or something else. It’s really difficult to decide on this. Kaiki and Araragi from the Monogatari series, Kyon from the Haruhi Suzumiya series, Oreki Houtarou from Hyouka, Garrus from Mass Effect, and Balthier from Final Fantasy XII. And Solaire from Dark Souls. He’s an idiot, but he’s an awfully strong idiot. Miyamori Aoi from Shirobako. Next would probably be Natsuki from Hibike! Euphonium. Not only because of the ponytail, but it’s a big part of the reason. Besides them, Akemi Homura from Mahou Shoujo Madoka Magica, Senjougahara Hitagi from the Monogatari Series, Aigis from Persona 3, Ritsu and Mugi from K-ON!, and Kumiko from Hibike! Euphonium are also up there. Mahou Shoujo Madoka Magica and Persona 3 are the two that always come to mind. You can see my top 10-ish here (like a lot of things, it’s not really up-to-date at this point). The pretty young anime girls. Duh. Yes. In fact, I have been living in Japan since September 2015. The header image is something I threw together using a silhouette of Miyamori Aoi from Shirobako. The blog icon is the Gekkoukan High School emblem from Persona 3. All images for posts I use come directly from the covered material unless I specifically state otherwise, and if I don’t mention it, it should be from something coming soon™. If I’ve put the featured image together myself, I’ll normally give info on the original sources at the end of the post. Thanks for following! And I have no problem if you include this site in your blogroll – thank you very much! A new aniblogger to check out. Neato! I’ll be sure to stop by every now and then. I guess Mikoto has a shower scene worthy body though I’d more like to see Kongo in one myself. <_< Now I'm going to think of that every time I look at my page. Be proud and not ashamed dood. I’m not ashamed, just… distracted. Thanks! Hopefully I’ll be posting a bit more consistently over the next few weeks. Also, here is a song.